Energy is indispensable in modern society and is one of the most important components of socio – economic development. Nepal is one of the least developed countries with more than 80% of its population residing in rural communities. According to IEA, Per capita electricity consumption of Nepal is 93 units, far below the per capita electricity consumption of Asia which stands at 806 units. India’s per capita electricity consumption stands at 644 units compared to 2,942 units of China. Nepal’s energy sector is dominated by the traditional energy sources such as fuel woods, agriculture residue and animal residue. Access to reliable energy supplies is fundamental for economic development (World Bank 2010). As humanity's dependency on electric power increases, large-scale power outages have grown endemic around the world and this has been having a major effect on the lives of people as well as corporate activities. Reducing economic losses by preventing power outages or reducing the amount of time required to recover from power outages is one of the major issues facing smart grids. In addition, Nepal has a huge hydropower potential with technically feasible capacity of more than 43,000 MW (WECS). Despite such a possibility, only less than 2% of this capacity has been explored. 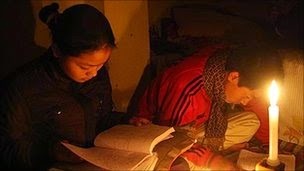 Present time in Nepal, has a huge deficiency of electricity. This study was conducted proposed to determine the causes and Impacts of power outages of Nepal and its potential solution by Renewable energy. Exploiting renewable sources for Energy is not only the sustainable solution but also reduces the CO2 emission in a developing country without fossil fuel resources. Lesson learnt from other countries have been tabulated and presented to the research as an advice for Nepal. However, Nepal can play a great role as a power provider to its neighboring countries like India and China if Nepal could harness its full potential. India and China needs huge sources of energy to keep their economic growth. In addition, For power exchange Nepal should have to invest huge amount in its infrastructure to send power up to long distance and also the save energy from highest rate of system loss more than 34%. HVDC system, Smart grid and smart metering are such new technologies that really help to keep system in balance and stop Electricity theft. Nepal has to follow the international trend to liberalize its Energy policy and follow the latest Power management system in timely manner. Public awareness can play a great role to reduce the unnecessary drain of electricity. Nepal also has to focus on Renewable Energy Technology like small hydro, Solar PV, Biomass and Wind energy as a fastest solution of power outage since the large Hydro power is more expensive and needs more investment and more time to complete. Nepal’s Geographical situation is also not favourable to reach national grid in all of the country. To address the deficiency in energy, more power projects should be built not only for current need but also for the rising demand in future.